I’m here today with something very exciting – an author interview! 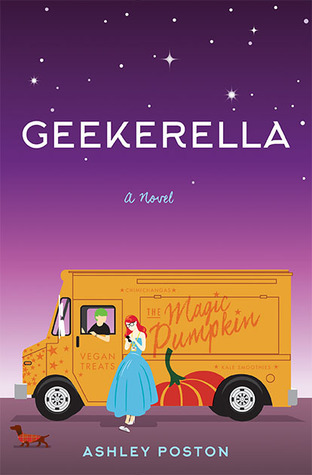 I adored her latest novel, Geekerella (review here), and I am extremely lucky to have had the chance to interview her. Tweet her at @ashposton and read her inner-most rambles at www.ashposton.com. When geek girl Elle Wittimer sees a cosplay contest sponsored by the producers of Starfield, she has to enter. First prize is an invitation to the ExcelsiCon Cosplay Ball and a meet-and-greet with the actor slated to play Federation Prince Carmindor in the reboot. Elle’s been scraping together tips from her gig at the Magic Pumpkin food truck behind her stepmother’s back, and winning this contest couldbe her ticket out once and for all—not to mention a fangirl’s dream come true. What made you want to set Geekerella in a convention? Geekerella had to be at least partly at a convention! What other great gathering of geeks could I celebrate? What was the hardest thing about writing Geekerella? Definitely keeping Darien and Elle’s timelines separate and yet running parallel to each other. It’s definitely harder than it seems. Name a song you think fits Geekerella perfectly. I write anyway. Eventually I’ll crack the block, right? Have you ever cosplayed, and if not, who would you love to cosplay as? I love cosplaying! My favorite cosplay is The Little Mermaid’s Ariel costume (when she’s on land). Would you ever consider writing about the story inside the story – Starfield? The world of Starfield feels like an old friend, so I would love to someday! Did you always know the ending of Geekerella, or did it come to you as you wrote? I knew I wanted a GRG (Grand Romantic Gesture) but I wasn’t sure what I wanted. In one draft, Darien showed up at Elle’s door, another at the food truck, but I think the current ending is my favorite. And the question we all knew was coming – is there anything else on the horizon for us to look forward to? Of course! My next book comes out in February 2018 from Balzer + Bray. It’s called Heart of Iron, and it’s a little Anastasia, a little Firefly, and a lot of sweet murderous cinnamon rolls. Thank you to Ashley for joining us! Today we welcome John Day to join us for another author interview! Born in England he spent most of his working life there running his own businesses. In 2005 he and his wife Carole, moved to the beautiful Channel Island of Alderney. Inspired by a dream one night whilst on holiday, perhaps it was the wine maybe the rich food, we shall never know, the sudden desire to write surged through his active loins. 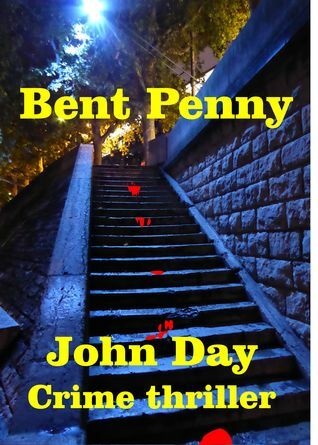 Although John has an extensive range of novels, we’re here to talk about Bent Penny, which I recently reviewed and you can find more about here! The psychological crime thriller, set in London, begs to be read in one go, tugging the reader onwards through its intense drama. Before we start, here’s the links to Bent Penny on Amazon and Goodreads. Now let’s welcome John! I hope you enjoy reading this interview as much as I did! What made you want to write crime? It was a readership decision. I want readers to enjoy my work so if they don’t want spies and adventure, I will write crime. What do you do to beat writers block? I don’t know what that is. I have never experienced it. It could be that keeping the thoughts out, is the bigger challenge. I created The Glass Beacon from just two items. I had the title in my mind and it had to include my home island. From that a WW2 spy thriller was born. No problem! As I mentioned above, I use an outline to define the story. I do have occasions when I am bored with the section. Perhaps I have an exciting piece to write, but the lead in or out has to be written first. Because of the outline I can pick the bit I want to write and another day I will feel fired up to do the lead in. There is no point writing if you don’t feel enthused and fired up. I shows in the words you use. In a way, an outline is like the idea for a short story. There is no loss of creativity within the section and you know exactly where you are with the book. It is a great aid to consistency. I loved Holly! Is she based off a certain someone? Holly is a cat! Many years ago, this black & white moggy entered my life as a kitten. At that time, I had just started up my own business and worked from a bedroom. It was dead of winter and I could not afford to put the heating on to keep warm. Holly would hang like a scarf around my neck as I worked at my desk. Shared bodily warmth. Later, she ditched me for a desk lamp. She would curl around the base, under the warm glow. The cat and I were very close. She also had attitude and some amusing behaviour patterns that I include in my Bent Penny and Dirty Penny books. I thought the lonely Penny needed a devoted friend to share her thoughts with and Holly has been immortalised as her faithful and smart pet. Yes, you guessed it, I am a softie. An example of Holly in Bent Penny. Penny followed Holly to the kitchen, the cat sought refuge there because she recognised the man’s voice. Last time that man called, the place went crazy with gunfire. Penny didn’t care why Steve was calling, she needed him in her life after all. She had no hang-ups about telling him she had changed her mind and would go with him. Holly would have to go into quarantine of course, but she would survive that… so would Holly. There wasn’t a single book. It was anything Enid Blyton churned out. I propose to read one of her books if I can lay hands on one. I am 70 and wonder if her magic could be rekindled in my old brain. Not to copy, I wouldn’t want that, but I fancy writing a children’s book. Thanks again to John for joining us! I have to say I am extremely jealous to hear you’ve never experienced writers block – who agrees that he’s very lucky? I’ve also just got to say that Enid Blyton played a massive part in my childhood, as I’m sure she has many of yours! Have any of you read her books, and what are your favourites? I remember loving The Wishing Chair series! Hi everyone! 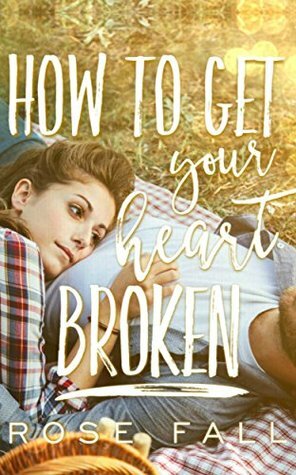 Today we welcome YA author Jessica George for a very unique interview! J.A. George is the author of the four-part series, GIFTED: THE HAYVEN SERIES. Jessica spent years of her life reading book after book before sitting on her bed one morning, opening her laptop and typing Chapter One into her word document. Now, not only does she read book after book, she now writes book after book too. When she’s not writing, she’s trying to break her record of finishing a tub of Oreo ice cream in less than forty-five minutes. She was just in the wrong place at the wrong time and happened to make a decision that altered her future forever. It happens to all of us every day. Avery Gray is a size twelve university student with a penchant for dry humour, and she’s as normal as they come. Up until now, the biggest choice she’s had to make was glasses or contacts? At the moment, it’s stay and save, or leave and be saved. But change is not always bad. Avery meets Theodore-James Connors, an enigmatic young man who takes her to Hayven, a city separated from the rest of the world, where only gifters – ordinary people with extra-ordinary gifts – can go. She soon finds herself in a close-knit group of friends she’d never have imagined herself in; friends who are diverse in every possible way, from their ethnic backgrounds, to their personalities, from their gifts, to their life stories. Friends who make her laugh, who make her cry, who make her think and who make her…her. However, change is not always good. The beautiful, golden city of Hayven has its dark side – Cliders. Gifters turned rogue, aka, Cliders are determined to aid fallen Clider, Madrina, return to rule Hayven. They will stop at nothing to make that happen, including harming those Ava has grown to love. Again, Ava is faced with a choice: spend her days finding a way to inhibit Madrina’s return, or walk away. After all, she isn’t the chosen one. Yet, there exists a third option – rig the future itself and make it work for her. And may we welcome Jessica, enjoy! Thanks for writing this. I’d like to start off by thanking Beth for allowing me to write this guest post because it’s a great opportunity to introduce the main characters from my contemporary YA fantasy novel, GIFTED to you all! I didn’t want to write about the same old author’s journey (but if you are interested in that, feel free to visit my blog: (www.thejourneyofgifted.com) so I thought I’d do something a little different! Blog readers, meet Ava, Theo, Baleigh, Lucas, Faye, Peyton, and Ollie. • Preferred name/nickname? Pretty much everyone calls me Ava. Lucas calls me Avs. • Hobbies? I like to read, draw, and hang out with friends. • Weak spot? For some reason, chocolate fingers. No idea why. • Interesting fact? I really like the taste of lemons. • If you could invite anybody to dinner? Roald Dahl, no question. He’s an imaginative genius. • Thoughts in the shower? My plans for the day. • How do friends describe you? Loyal, funny, and patient. • Pet peeve? Negative opinions. • Biggest fear? Losing loved ones. • Gift? Telepathy and pre-cognition. Uncontrollable pre-cognition, I might add. • Perfect day? Browsing an arts supplies store. • Favourite quote? Normal is boring and nobody is good at it. • Preferred name/nickname? Theo. My big sister calls me TJ. • Hobbies? Reading, socialising, travelling, and charity-work. • Favourite food? My grandad’s spaghetti bolognese. I make a pretty good replica. • Weak spot? My mum’s chocolate chip cookies. • Interesting fact? I used to want to be a lawyer because my dad is one. • Dinner guest choice? Martin Luther King. • Thoughts in the shower? The country I’d like to visit next. • How do friends describe you? Loyal, spontaneous, curious, and compassionate. • Pet peeve? Judging the interior by the exterior. That really gets to me. • Biggest fear? Living and dying in the same city. • Perfect day? Walking through a city I’ve never been to before. • Favourite quote? I haven’t been everywhere, but it’s on my list. • Preferred name/nickname? Bales. Only one person ever called me Bayleaf. • Hobbies? Krav-maga and eating. • Weak spot? Millionaire’s shortbread. • Interesting fact? I like the rain. I kissed Theo once. I wanted to be a doctor but hated the thought of having to deliver bad news. Pick whichever you think is more interesting. • Dinner guest choice? Marie Curie. • Thoughts in shower ? Breakfast. • How do friends describe you? Honest, sarcastic, protective, funny, well-meaning. • Pet peeve? Lies. If you don’t have the balls to tell the truth, keep your mouth shut. • Biggest fear? Losing parents or friends. • Gift? I’m a miroux – a shapeshifter. • Perfect day? Shopping and eating. • Favourite quote? Be who you are and say what you feel because those who mind don’t matter and those who matter don’t mind. • Preferred name/nickname? The obvious answer would be ‘Luke’ right? I don’t really have a nickname, but prefer it that way. • Hobbies? Girls. I know that’s not the best answer I could give, but I if you’re going to read the book, I might as well be honest. You’ll find out eventually. • Favourite food? Chips. Or fries, as Americans call it. • Weak spot? Chocolate buttons. I always carry a small packet. • Interesting fact? I’m great at juggling and my millionaire’s shortbread is unbeatable. It should be, it took a lot of practice. • Dinner guest choice? Dmitri Mendeleev. • Thoughts in shower? Guess. • How do friends describe you? Funny, big-hearted, lothario. • Pet peeve? People who assume they know me because of what they’ve heard. • Biggest fear? Pinpointing a fear. • Gift? Firider – I can produce fire. • Perfect day? Friends during the day and a girl for the night… I’ll admit, I’m not looking so great right now. • Favourite quote? Life is better when you’re laughing. • Preferred name/nickname? I don’t have a nickname. I suppose it’s because my name is short as it is! • Hobbies? Long walks, feeding the ducks, reading, eating out, seeing my friends – they’re like family. • Favourite food? Chicken burgers. • Interesting fact? I like to skateboard. • Dinner guest choice? Dr Seuss. • Thoughts in shower? I usually sing or hum songs from my favourite musicals. • How would friends describe you? Shy, sweet, kind, gentle, and warm. • Biggest fear? Forgetting to protect others and not just myself. • Gift? Shield. I can project this invisible force field around me that no-one can get into unless I project it around them too. If you try to force your way in, it…stings. • Perfect day? Spent in Mysteria Park or going to a theatre. • Favourite quote? To be truly happy you must give up on pleasing others. • First thing you said in GIFTED? “Hello.” Not very exciting, is it? Sorry. • Preferred name/nickname? Peyton. My mum calls me PJ which has led to Eliza-Poppy, my youngest sister, to call me Peanut Butter and Jelly. • Hobbies? Meditation, some might say daydreaming, and yoga. • Weak spot? Boiled sweets. • Interesting fact? I have a tattoo on my back of a dreamcatcher. • Dinner guest choice? David Attenborough. • Thoughts in shower? Whatever my daydreams choose. It varies every day. This morning I simply thought of polka-dots and zig-zags. • How friends describe you? Kind, ditzy, free-spirit, and patient. • Pet peeve? Animal cruelty. • Biggest fear? Losing my mum or sisters. I hate to even imagine it. • Perfect day? Spent exploring the amazon rainforest. • Favourite quote? Until one has loved an animal a part of one’s soul remains unawakened. • Age? 21. I’m the oldest of the group. • Hobbies? Reading absolutely anything. • Favourite food? Whatever my mum cooks. Literally. • Interesting fact? People think I was born clever. It actually took a lot of work. • Dinner guest choice? Everett Stone. • Thoughts in shower? If I’ve been stuck trying to solve something, usually that. • How friends would describe you? Smart, funny, charming, kind, and humble. Their words, not mine. • Biggest fear? Losing my friends or family. • Gift? Atmokinesis – weather control. • Perfect day? Spent with friends and family. Hopefully with a cup of coffee and a plate of biscotti. • Favourite quote? Learning is an experience. Everything else is just information. They’re a lovely bunch, aren’t they? What an interesting idea and characters, I can’t wait to start the book! As you all know, I’m in Paris (or at least I should be by now, I’ll be keeping you guys updated on Twitter! ), so most of these posts were written over the weekend (hi from the past (spooky)). Anyway, today is a very exciting post…my very first interview with an author! I’ve wanted to do something like this for a while and as there is 5 Monday’s in February, I had a spare day to blog about anything I wanted. So I quickly contacted Tiffany who said yes to an interview – thanks Tiffany! 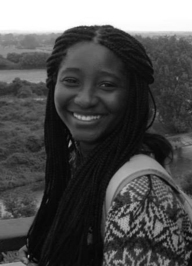 Tiffany Gholar bio: a Chicago-based artist working in a variety of media. I have three primary bodies of work: The Doll Project, Post-Consumerism, and Recessionism. I studied art as an undergraduate at the University of Chicago and interior design at Harrington College of Design and hold a Masters Degree in Painting from Governors State University. My art has been exhibited in many Chicago-area venues, including group shows at Woman Made Gallery, The Chicago Children’s Museum, and the Chicago Center for Green Technology, and in solo exhibitions at the Harold Washington Library and The Adler School for Professional Psychology. 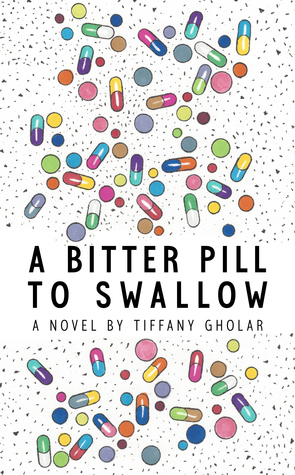 Tiffany is the author of A Bitter Pill To Swallow, which I read earlier this year and loved! Personally, I found Tiffany’s work extremely inspirational, and I would definitely recommend A Bitter Pill To Swallow. How did you find writing in the point of view of children and adults? In A Bitter Pill to Swallow I had to switch back and forth from teen and adult perspectives. It was interesting and made me consider what observations a teenager might make as opposed to what an adult might think about. Name a song you listened to while writing A Bitter Pill To Swallow (or one that gave you inspiration)? I listened to a lot of songs from the 90s to refresh my memories of what it was like being a teenager then. In fact, I made a special playlist. One song I found myself listening to on repeat is “Dog It” by Digable Planets. Name a favourite quote (either from a book or just in general)? I write everywhere I can, but my favorite place to write is at my art studio. Even though I set it up as a place where I can paint, I have an area that’s perfect for plugging in my laptop and writing. Have you ever kept a journal, like Janina? Yes. I have been an avid journal writer for most of my life. I saved most of my old journals. Reading some of the things I wrote as a teenager helped to inform my characters’ journals. I have to agree with that last one! Look out for (hopefully) more author interviews in the future – and a pre-written (I have nothing to hide) chat post tomorrow.